GeoSafe is an application for first responders. 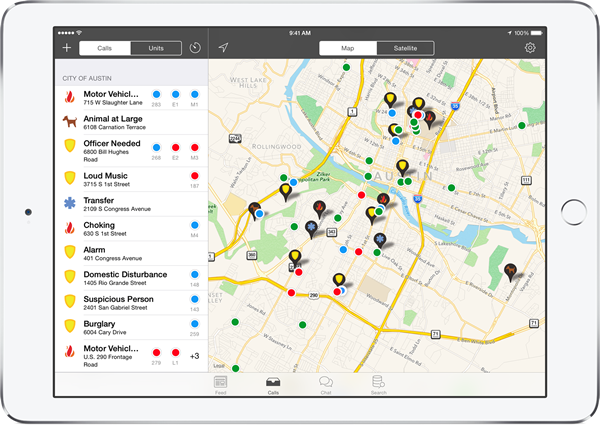 GeoSafe was created to help organize first responder teams so they can operate quickly and keep track of their responders. This type of program is essential because when responding to fires or other emergencies, the speed that the firefighters or rescue squad gets there can be the most important thing when people are in danger. GeoSafe provides GPS tracking and CAD integration for police, fire, and EMS. On the app they are able to quickly access and communicate critical data to units out in the field. On the system 9-11 call information and dispatcher notes can be seen to keep track of units assigned to the call. There are different symbols for each type of call, and there is a map that displays the different calls, and where the units are. Color-coded units show who is busy, en route, or available. The application allows different squads to seamlessly share data and coordinate multi-agency responses by viewing all units on the same map. This application works on iPad, iPhone, and Windows. Geographic technologies can be put to uses to help organize first responders and save lives more efficiently.